Fed up of endless wires, cables and plugs that don’t utilise space? Then try the Pivot Power, an adjustable electrical power strip that holds large adapters in EVERY outlet! Pivot Power has a unique form which allows it to bend and twist in multiple configurations allowing you to save space. The Pivot Power costs £29.95 from www.prezzybox.com. There’s a debate brewing across the globe, and it centers on smartphone use. One camp can’t imagine life without their mobile device firmly implanted in the palm of their hand, while the other side bemoans the days when people actually talked to one another. Never before have we been so connected to friends, family, news, entertainment news and gossip, games, our camera and photos, video, music, GPS—we have instant access to pretty much all the knowledge and information mankind has ever accumulated. Whichever side of the fence you fall on, one thing for sure: It can get overwhelming. That’s why we’ve put together this list of the seven best (and in some cases, lesser-known) apps for women. We feel mobile technology should augment and complement our lives, not take over them. These apps can help you achieve your goals in varying areas of your life, after all isn’t that what technology is about? For busy women trying to maintain a polished presence both for business and social settings, the Pose.com personal stylist app is a godsend. More than just the “fashion police” at your fingertips, Pose serves both as a personal virtual stylist and wardrobe consultant. Already in use by an estimated 1 million people worldwide, Pose features easy-to-access fashion categories, browsing and sharing. Users need only tag each outfit with brand names and the name of the stores or locations where they were purchased. A particularly popular Pose feature enables users to buy outfits straight from the snapshots they find, eliminating the need to search the Internet for specific brands or types of clothing. If you’ve ever lost precious photos and videos because they weren’t backed up, or you’ve had to scramble to clear up space on your phone because these types of files were taking up too much memory, then ZipCloud is for you. ZipCloud is a new online cloud storage company based in the U.K. and the U.S. Once you set it up on your device, your files will sync silently in the background—you don’t have to do a thing. If you accidentally delete something, a few clicks and it’s restored. You can read reviews of the best online backup at onlinebackupgeeks.com. Cupid.com isn’t your typical online dating site. First, it’s a phone/computer app, not a dedicated site. Second, other services are almost wholly dependent on the answers supplied by users when it comes to matching them with ideal mates. Cupid utilizes profiles of people living near you, while offering the freedom to go beyond recommended matches and browse any or all of the profiles offered. It also features a built-in chat option for live communication in real time. As mums, we fear exposing our kids to too much technology or that they’ll become reckless with it. Kid’s Place for Moms is an app that enables parents to make a safe zone for their kids—putting the power back where it belongs—with the parents. Block inappropriate apps or content, lock their phones when it’s time for bed or monitor their phone activity with this app. The Hapi Fork is the sharpest utensil in your drawer. The sensor-laden fork records everything from the number of fork servings per minute and per meal to the total time of the meal, and the start and end times of each meal. All the data collected during your day (or meal) can then be uploaded via Bluetooth or USB technology into a smartphone, laptop or home computer to record your food intake. You can use the information to alter your eating habits and minimize the overeating trails that promote weight gain. Personal networks are key to success, whether at work or home. The second wave of photo sharing is Vizible, a photo- and video-sharing application that uses Twitter photos to connect you to the people in your neighbourhood. It’s a great app for women moving to a new area or parents looking to connect with other parents. Vizible syncs only with Twitter and allows people to choose the radius of communication. From 99.9 percent anti-bacterial soaps and lotions to air cleaners and water filters, hygienic living has become a burgeoning cottage industry. There’s an app called Lapka that offers women a way to take clean living a step further. Lapka works as a personal home environmental monitor and notices things that the typical person cannot, such as electromagnetic or high frequency waves as well as radiation. Lapka, which barely takes up space in the palm of one hand, can even tell which foods are fresh and organic and which are not. The broadband boffins at Virgin Media have been hard at work and a next generation Super Hub is on the way. The new Super Hub will launch in the coming weeks and boasts maximum speeds even faster than BT’s new Home Hub 4 thanks to an extra antenna on the 5GHz channel that improves range as well as speed. Powered by the latest dual band technology, Virgin Media’s new Super Hub will enable concurrent access to both the 5GHz and 2.4GHz wireless channels and deliver unrivalled connectivity throughout our customers’ homes. 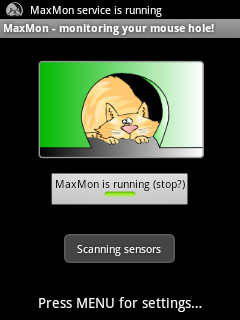 MaxMon is a free Android app that lets you use an Android phone as a monitoring system. Rather than just using your personal phone to connect to the internet and find out what your sensor is reporting, the MaxMon app turns your phone into a data collecting device. The MaxMon app monitors mains power and vibration using sensors built into the phone (with a shake-to-alert feature useful for people in distress) and if you have Wi-Fi at your remote location you don’t even need a SIM in the phone, or a mobile phone contract. Great uses for MaxMon include monitoring elderly relatives living alone, boats in marinas, unoccupied properties and so on. MaxMon are very keen to stress the social benefits of their app and the lost cost nature of their business. Not only is the app free to download and able to run on cheap hardware, but the entire business was started with just £10k. Founder Martin Lambert is over the moon with this, saying he “burned through $50M+ of investment” in his previous venture. If you need extra sensing capability such as temperature, humidity or motion monitoring you can purchase an external gadget (the cutely named Quatropus – picture above) from MaxMon that connects to your phone and enhances its inbuilt sensors.